Prof. Dr. George Dimitriadi – Educated in MIPT (Moscow Institute of Physics and Technology) with final Ph. D. (Mathematics) and Higher School of Economics in Moscow with final Master of Science degree in Economics. He has more than 15-years experience in banking, now provides consulting services. 1. PwC Academy "CIMA DipPM (Rus)" exams preparation. 2. Implementation of IFRS in banks. 3. Optimisation of taxation and legal regulation of operations using payment cards. Legal regulation of electronic commerce. 4. Methodology and tools, administration of ARIS, creation and using of ARIS scripts. 5. Oracle: System Modelling Techniques. 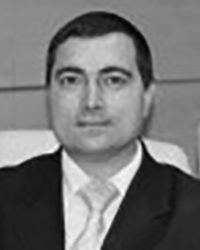 Prof. Dimitriadi joined CBA as associated Consulting Professional in Moscow in November 2017.